Courseware management programs help companies manage and distribute their printed and electronic training materials quickly, securely, and cost effectively. How easy is the system to use for your team, your partners, and your students? What document types does the system support, and is this flexible? Does the system have POD (Print-On-Demand) capability? Is it integrated with a print and fulfillment partner who can produce your materials accurately and as needed? How secure is your online educational content? Can the system customize and even personalize your courseware? What about co-branding for your training partners? 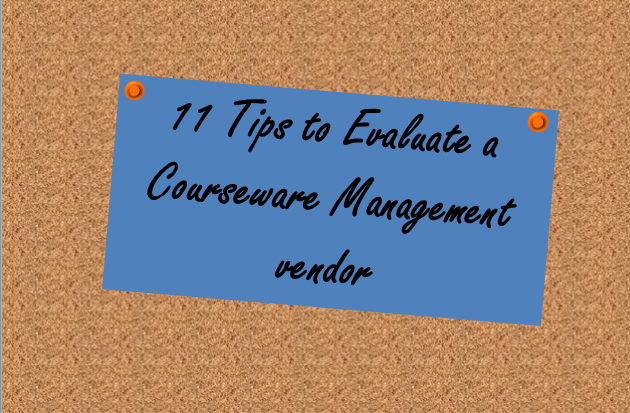 If you offer prescriptive learning, that is, learning based on certain product configurations or customized for specific customers, is the system capable of creating such custom courseware? Is the system able to integrate with your pre- and post-marketing programs for your learning services? Can your training team access your body of courseware easily and efficiently? Is there robust e-commerce functionality built in to your management system, allowing training partners and other team members to order courseware as needed from your e-store? Are multiple payment options supported? What about payment in foreign currencies? Since printing & fulfillment of training manuals are one of the largest expenses associated with a course offering, how does this system help you manage these costs? How sophisticated and customizable is the P&L function, and what kinds of accounting reports does the system generate? Can a courseware management system be integrated with your marketing portal, creating a single, central repository of all of your digital assets – including course materials? Whether your primary concerns are document security, courseware customization, cost control and analysis, or global delivery, it’s important to find a courseware management program that works for your company. These 11 points will be helpful in your evaluation of companies offering such systems. Make sure you work with a partner who has experience in courseware management, distribution and delivery.